The sociopath is the magician, who will prepare the greatest illusion on earth.. 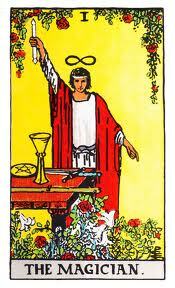 I had practiced tarot for a long time, since I was sixteen years old. I had no idea that the person that I was involved with, was either a sociopath, or even that he was a compulsive pathological liar. Shortly before he ran off with money that he had stolen from my bank, I had felt anxiety, but I wasn’t quite sure about what? I set out a tarot spread, which repeatedly brought up the magician card. It was reversed. Magician can indicate greed, deceit, manipulation and using one’s skill and ability for negative ends. It can reflect trickery and cunning, untrustworthiness and mental confusion. The reversed Magician may represent your typical used-car salesman. He uses his charm and his power in a manipulative manner to convince you of his point of view. Always be careful of this type. Make sure you know what you are buying into rather than being swept away by the excitement he generates. It is funny how often we have all of the warnings in front of us. Yet we still refuse to see what is right before our very eyes. A year ago today, he had taken my bank card and was helping himself to free cash from my bank. “Well, that is rubbish, I am no con man”. I believed him because I didn’t want it to be true. The anxiety wouldn’t leave and I was writing my diary about how I FELT. It was important, as if I tried to raise anything with him, he would deny it, and would often be angry. I felt that I was in the wrong for not trusting him. The feeling wouldn’t go away. He didn’t like to be confronted. I was in the shower, when he went to the shops that day, or at least that is what he had said he was doing. I wrote how it felt wrong, and that I didn’t trust him. The feeling of mistrust, was almost overwhelming. It made me feel anxious, but his reactions would make me doubt my own feelings and so I would write them down instead. The truth was that there was a reason for me to feel this way, as I later discovered, he wasn’t at the shop,he had taken my bank card, and was withdrawing cash. Planning his escape. He took £350.00 out of my account in two days. He was also using my card in shops. The evidence, was right in front of my eyes. I was suspicious. I sensed it. I felt it. I brought it up with him. However, I didn’t WANT it to be true, I still wanted the illusion. I didn’t realise that he was selling me MYSELF and exactly what I wanted. I was living in the mask of illusion, and I was definitely deluded. He was a craftsman and master at lying, deceiving, gaslighting, and deflecting, I ignored the signs that were staring me right in the face. At this point, I trusted him more than I trusted myself! This is the point. For many years I worked with vulnerable people. I often worked with women who were fleeing violent and abusive relationships. In early years, I wondered, why did they stay? 2. You WANT this illusion that they have sold to you (because this is what they accurately assessed about YOU in the beginning). The Magician reversed often suggests that you may be out of touch with reality and struggling to bring yourself back down to earth. There may be confusion, impatience and lack of a clear plan. You need to return to the lesson of the Fool and free yourself from the current situation in order to give yourself some perspective and reassess the situation. If you are in a relationship like this and you see the signs, you sense deception, and you feel that something is not right. If the evidence is right there in front of you. Write it down. Go back to it. Revisit it. It is likely that your feelings are right!! The sociopath might tell you that you are being paranoid, stupid, use all his trickery and gaslighting to fool you some more. The sociopath is teaching you, to trust yourself. The longer that you stay with the sociopath, the greater your losses will be. After this date a year ago, it continued, he was to take money from my bank account again, in two days time. And two days later he would leave, having stolen hundreds this week. And then, even more stupid, after a few weeks, I let him come back!!! And he did it all again for another two months. Getting me thousands into debt. You might ask yourself why me? How did I deserve this? What you do not realise, is that there is nothing in life which is a mistake. Everything happens for a reason. Sometimes you need to meet the master magician, and be part of the greatest illusion, to learn, perhaps for the first time in your life, to – TRUST YOURSELF!!! And this is the lesson of the relationship with the sociopath. To learn – to trust yourself. That’s pretty cool. In new Orleans, where im from, energy can not be created or destroyed but changed from one form into another, kinda like karma. so if someone wrongs you there are several ways folks handle it. For some, they call the police, or hire an attorney, others gossip and bad mouth but then there are a few that put a “Glee Glee or hex” some say its superstition while others believe in it just as one believes in God or religion. I’m an underground writer with a loyal following which has forced me to write a fantasy book named LondenBerg by Lord Biron. Check it out sometime, thanks! Again.. Wow! I too have read cards for several years now, yet rarely do I do a reading for myself. Reading about your magician experience has allowed alot of locked memories to surface. Thank you!. I just remember I gave in and finally did a reading for myself when something wasn’t feeling right. Amongst other cards I got the 3 swords, and the devil. In my mind it just didn’t make sense! I even had dreams alluding to my partner having affairs which I shared with him. I was seeing things(energetically), getting increasingly jealous for what I was told was “no reason”, I was convinced I was spiralling into depression, which I was no stranger to. Or going crazy, I didn’t know if I was imagining things or intuiting.. I took some time out, away from him where & when I could to try and energetically regroup & re ground myself. Goodness! Another memory…, I found 4 pairs of undies in his house when cleaning for him, he looked me straight in the eye and fed me some BS that I believed!!! I also found a photo in a frame of him and his’ other ‘current’ girlfriend at the time, about a year ago… Again, more BS. and I believed it- so so so silly 😦 no remorse, nothing… Treated me like I was the fool for even questioning…! I never ever in a million years would have imagined he could have affairs, until I saw it with my own 2 eyes! Online, in person, emails, relationships, every opportunity he got, he took! I remember feeling SO relieved when I found out, because I wasn’t going crazy! I felt empowered, that my intuition was spot on! It was the first time I really ‘saw’ him. His eyes the way he looked at me, there was – nothing, vacant. Like a shrug of the shoulders, and that’s it! But… I went back…. Ooooo! if only i found your blog then! All in divine time. Oh thank you Namaste, your last paragraph did make me laugh!!! It isn’t funny i know, but I really do get it. that is exactly what it is like. If people want to know the difference between a sociopath and a narcissist i think that is it, the mask that they wear and my god they do it so well, and it is the master of illusion. Think about it with the magician card, especially magician reversed, ah this is the charismatic sociopath for sure!! 🙂 I should have a forum up and running this week. But I know, I think I dated the same type…..we stayed friends for a year afterwards, and I still miss him sometimes today!! Yes Katalina. I would say that making up a PHD is far fetched, but you never know with the sociopath. There was that time he told me he was running a marathon, said he was defending his title, had won in his age group the year before. When I asked him how the race went he said, “oh well my friend H was there and he always cleans up, but it was fun anyway”. Something about the timing of it seemed weird – he was back at his house awfully early. But it was weeks later when it occurred to me to look it up on Sports Stats. Neither he nor his friend ran the race that day. And he did not win in his category the year before, did not even run the year before. Last time he ran that race was 2009, and he didn’t do especially well. So now I consider everything he said, every claim he made to be a lie until proven true. I just gave myself a tarot reading asking them “Was he (my ex) really deceitful throughout the relationship” and the reverse magician popped up. I knew deep down but I guess I tried so hard to deny it. I am learning to trust my feelings and importantly respect them.